What if all the stories started to come true? That’s what the hero of Trail of Lightning, Maggie Hoskie, has to face. 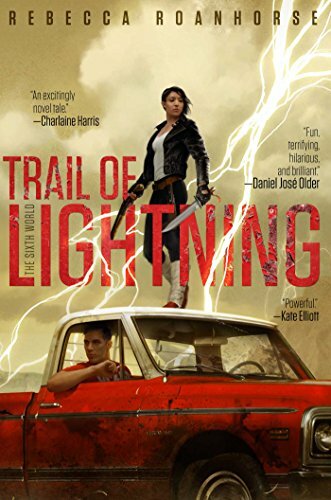 Living in the land of Dinè (what used to be called the Navajo reservation), Maggie is one of the few with the wits, training, and grit to face the monsters that roam the world since an apocalyptic earthquake flooded most of the former United States. As if that wasn’t tricky enough, she also has to maintain working–and sometimes personal–relationships with a couple of demigods. It’s difficult to be concise when talking about everything I liked about this book. The setting is meticulously rendered. The action and paranormal mystery is perfectly paced. And then there are the characters. Kai, on the other hand, is a medicine-man-in-training and a smooth-talking delight. He’s less certain about the merits of shooting/decapitating enemies before they can shoot/decapitate you than Maggie is, but he displays his own kind of grit and a kind of dogged belief in Maggie’s goodness that makes him a perfect foil for her darker energy. Plus, I love a flirty character–especially when they’re flirty-but-careful-to-get-consent. And, of course, there is Coyote. (Yes, the Coyote.) But about him I can’t say much of anything without spoiling the mystery. This is one of the books that I’m recommending to everybody this year. It’s fun, is fresh, and it’s escapism at its very best.